QUICKSTART TENNIS is here! Green Tree’s beginning and advanced beginning tennis program is for children who are elementary school age 6-9 years old. 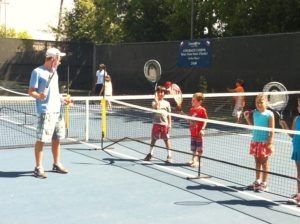 QUICKSTART is USTA’s new and exciting play format for learning tennis. It is structured for kids to be able to rally, play quickly and have fun! This format of play is for beginning and advanced beginning juniors. Juniors will be grouped according to age. Players will meet one time each week on Sundays for four weeks and will be grouped according to age and skill level. NOTE: QuickStart tennis meetings will be made up if canceled because of inclement weather. If your child misses a Sunday meeting for other reasons, a make-up day may be possible on Tuesday or Thursdays at 4:30 or 5 pm.